Tonight's beer comes from the beer lover's country of Belgium. It has been brought to my attention that it's been a while since I reviewed a dark beer so here it is, well sort of... Kasteel Donker is actually a Quadrupel, it's not your typical dark style but from all reports this one is particularly dark. Like almost all Belgian beers Kasteel has it's own glass and it's one of my personal favourites. The chalice has a square stem coming out of the top of the castle, which has been crafted in absurd detail. According to the guys at the European Beer Cafe in Melbourne it's far and away the most stolen glass. It's got to the point you need to leave your license behind the bar when you order one! True to form Kastel Donker poured a very dark colour. It's a very dark brown coloured liquid with the tiniest hints of light making it's way through to be recognised on the other side. The head was a little bit of a disappointment, especially for a Belgian beer. It was less than a finger high, a funny light brown colour and had poor retention, however it did lace the glass quite nicely. 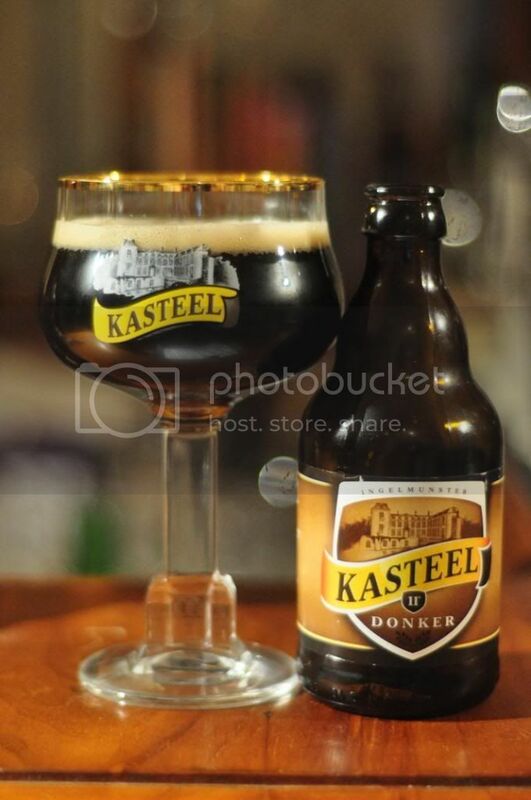 Kasteel Donker has a typically Belgian nose. It's very yeasty with plenty of spiciness, almost to the level of cloves. There is also an abundance of dark fruits with some hops towards the back end. There is a worrying amount of alcohol on the nose. It's quite an intense nose as well with all of these aromas very pronounced. Comparing Kasteel Donker to some of the other Quad's I've had is easy on some points and very difficult on others. In terms of flavour it is quite complex with a nice balance between malt and hops. The caramel malts and dark fruit flavours are complemented very nicely by some dark fruit and just enough hop bitterness. The problem with this beer for me is the mouthfeel and the alcohol content, neither are right and actually make the beer a little difficult to drink. Ok so while I love the flavour, I'm having one major issue with Kasteel Donker; the alcohol hit. At 11% it's just too strong and overpowering, maybe if it was better disguised this would be less of a problem but for me it's just not working. If you are really into Quad's it wouldn't be the worst beer to try but remember my warning about the alcohol flavour.